After a long and cold winter in Toronto, spring has finally graced us with the sun and warmth many of us were waiting for, bringing with it as well opportunities to see some great Korean films in theatres around Toronto. 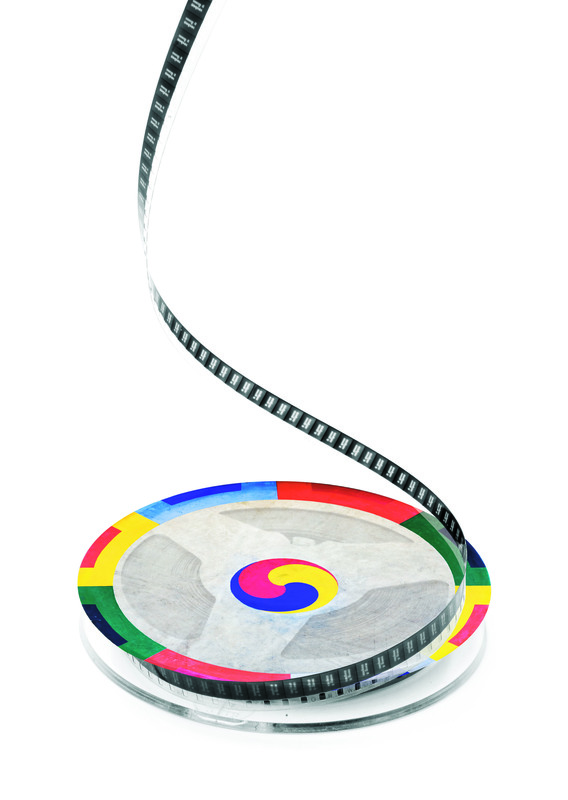 Kicking things off on the weekend of May 8 and 9, the Consulate General of the Korean Republic in Toronto, along with the Korea Foundation, is hosting the 2015 Korean Film festival at the TIFF Lightbox. On May 8 at 7:30 pm, Duresori: The Voice of East is the first film on the program. Released in 2012, Duresori is an independent film depicting the trials and tribulations of traditional Korean singing students who must sing in a choir to save their school’s reputation. The film features an amateur cast of real singing students and boasts a totally original score. I might have to check this one out myself! The rest of the films are playing throughout the day on the 9th, with The Plan Man at 1:30 pm. Released in 2014, the film tells the romantic and absurdly comedic story of an obsessive-compulsive librarian, who must set rigid plans for everything he does, falling in love with a rock-musician convenience store clerk who is his polar opposite. The film features the prolific Jung Jae-young in the lead role alongside Han Ji-min, who’s played in countless dramas, including the famous 2003 series Dae Jang Geum. Despite its dopey plot, Plan Man has received favourable reviews from many critics and looks like a good bit of fun. This is followed at 4:30 pm by Detective K: Secret of Virtuous Widow, the first in the comic Detective K series, featuring Kim Myung-Min as Detective K, the best detective in Joseon, who must solve a series of murders related to a woman who is also played by Han Ji-min. The film was released in 2011 and spawned a sequel just this year. The final film, at 7:30 pm, is 2013’s The Face Reader, featuring a star-studded cast and also telling a detective story, albeit with a much more serious tone. 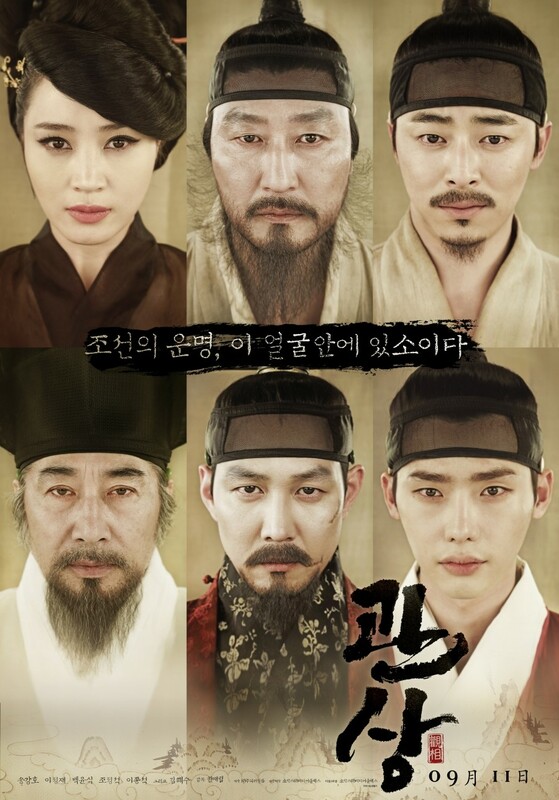 Song Kang-ho plays the best face reader in Joseon. He must detect traitors to the king by using his face-reading abilities — a traditional practice that was thought to determine someone’s characteristics and traits by examining their facial features. The Face Reader boasts an all-star cast with one of my favourite actors, Sung Kang-ho in the lead. The best part about this festival is that all the tickets are free! Just make sure to book them in advance and check for further details at http://www.eventbrite.ca/e/2015-korean-film-festival-tickets-16425576341. For those of you who cannot spare the time that weekend, worry not! From May 26 to 31, the Toronto Korean Film Festival is hosting its fourth annual event, “All Strings Attached,” featuring a number of themed screening days at Innis Town Hall at the University of Toronto. The theme of this year’s festival is ggeun (끈), which translates as “string” but is also a motif denoting connectedness among individuals. Each film deals with this connectedness theme in some way, and the series offers a considerable amount of variety. To this effect the festival is showing a number of local Korean films, as well as numerous films from myriad countries by members of the Korean diaspora living there. 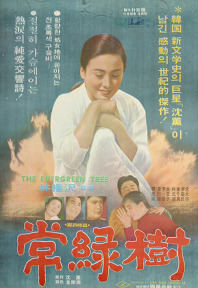 Evergreen Tree will be featured in the classic film showcase on May 27th. These films range from documentaries and short films to dramas and animations. The festival is even setting aside a day for screening films produced by Korean-Canadians as well. Similarly, one of the screening days, May 31, is set aside for a showcase of short films beginning at 1:30 pm. It offers a rare chance to see the work of the next generation of aspiring Korean filmmakers, which is of particular interest to me. 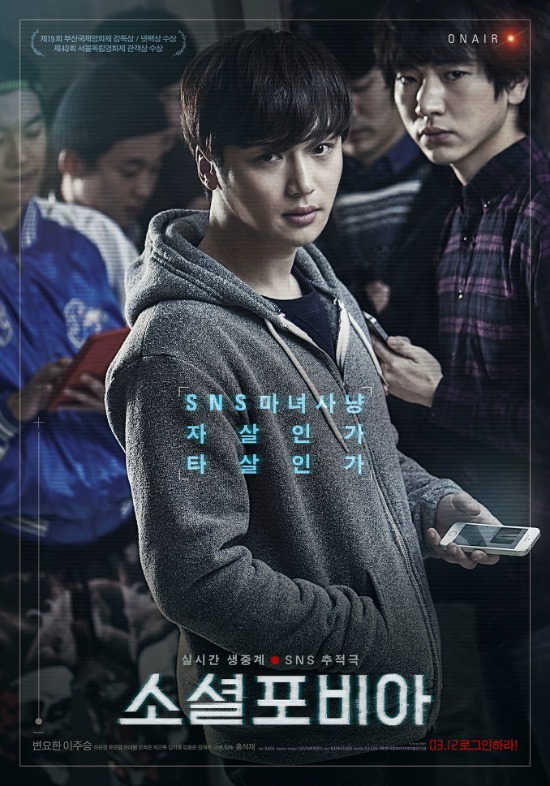 The new thriller Socialphobia, featuring a group of youths attempting to solve a murder over social media looks riveting. There are number of films that are of particular interest to me. The first of my personal picks is the 2015 film Socialphobia, directed by Hong Suk-jae, screening on opening night. It tells the story of a group of youths who attempt to solve the murder of a classmate via social media, in what looks like a riveting attempt to capture the zeitgeist. A few of the films in the Korean Diaspora program are of considerable interest to me as well, such as Park Sayu and Park Donsa’s One for All and All for One, a documentary that follows the story of a rugby team playing in Osaka that is made up of Japanese members of the Korean diaspora, and their struggle to succeed in their league. 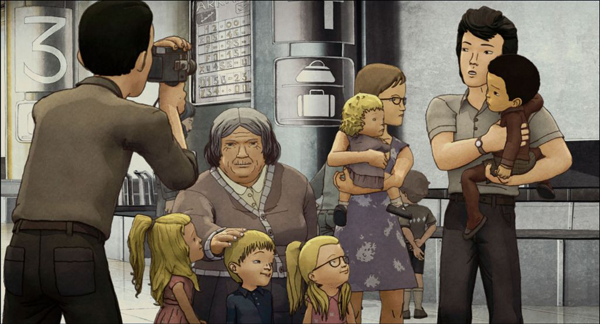 Another, Jung Henin’s Approved for Adoption, is an animated feature following the real-life story of a Korean man adopted by a Belgian family. It looks beautiful in its animation as well as compelling in its narrative. Approved for Adoption, part of the festival’s diaspora program, follows the story of a Korean boy who is adopted by a Belgian family. The animation looks splendid. I’m also really looking forward to the Classic and Short Film showcases as well. The classic film is Shin Sang-ok’s 1961 film Evergreen Tree, which follows the story of two college graduates who seek to modernize a small village under the watchful eyes of the Japanese empire. This film will be preceded by a brief lecture by one of my very own professors, Korean studies specialist Janet Poole, and should offer an interesting dramatized look at a slice of Korean history. One For All and All For One, a documentary telling the story of the best rugby team in Osaka which incidentally is made up of Korean Diaspora. I’ve only talked about a few of the films here, but the folks at the Toronto Korean Film Festival have put together an impressive program comprising dozens of films, so there should be something for everyone. On May 1 the festival organizers are hosting a fundraising party, which will feature an art exhibition and market, music, video presentations, live performances, screen printing, a flea market and, best of all, beer! The event is being held at Beit Zatoun, 612 Markham St., at 6 pm. Admission is $5. For more details, including the full list of dates and films as well as how to obtain tickets, hop on over to http://www.tkff.ca/ and get ready to enjoy some truly unique films! Hope to see you there. Not one but TWO Korean Film Festivals! I must say, I am jealous. I have seen Approved for Adoption, it mixes animation with home movies from Jung Henin’s childhood. There is a book, too – a graphic novel.